Investigations into Donald Trump’s foreign entanglements may have largely begun with Russia, but the president and his family have a special relationship with India, too. Since Donald Trump and his children first began talks with developers in India, around 2007, the Trump Organization has entered into more deals there than in any other foreign country. Five of them are still active—four luxury residential projects and one commercial tower—and are valued at an estimated $1.5 billion. Donald Trump Jr. has made at least ten trips to India over the past decade, calling the country “the biggest push for our organization.” His most recent visit was a headline-grabbing jaunt in February. In the days leading up to his four-day, four-city tour, all of the leading English-language newspapers in New Delhi carried full front-page ads featuring an image of Donald Jr., asking, “TRUMP HAS ARRIVED. HAVE YOU?” and, “TRUMP IS HERE. ARE YOU INVITED?” Anyone who, by midweek, had put down a deposit of about $39,000 on an apartment in the newest Trump Tower India project, located just outside New Delhi, would be invited to a Friday night dinner with him. Before Donald Jr.’s private jet had even landed in the Indian capital, sales reached $15 million, according to a local business TV station. He was, at the very least, representing the Trump Organization’s way of doing business. When Donald Trump’s bankruptcies in the 1990s and early 2000s left him unable to attract commercial financing to develop his own buildings, he turned to a new business model: selling the Trump name to other developers, many of them overseas. On the day he was sworn in as president, Trump had at least 50 licensing and management deals scattered across the United States and around the world, according to The Washington Post. The Trump Organization uses this model in India, too, which allows it to claim that it has no ownership stake in the towers under construction there that will bear the president’s name. Still, members of the Trump family have been intimately involved in all facets of these projects, according to multiple sources. They have selected the business partners and overseen the construction, design, and marketing of each property; when flagrant violations of government regulations threatened the success of one deal, Donald Trump Jr. intervened directly with a high-level official. These deals, according to financial disclosures filed by the president with the U.S. Office of Government Ethics, produced royalties of as much as $11 million between 2014 and 2017. The Trump Organization has more deals in India than in any other foreign country, with five still active, and valued at an estimated $1.5 billion. In India, Donald Trump has repeatedly chosen to partner with people who have close connections to “extreme and corrupt politicians,” as the Center for American Progress recently put it, and, in one case, with a far-right elected official himself. A months-long investigation of the Trump Organization’s business partners in India, conducted in collaboration with The Investigative Fund and reporters at the Indian daily newspaper The Hindu, uncovered a long history of lawsuits, police inquiries, and government investigations that contain evidence of potential bribery, fraud, intimidation, illegal land acquisition, tax evasion, and money laundering. Moreover, the Trump Organization’s ties to these partners leave it potentially vulnerable to violations of the Foreign Corrupt Practices Act, the 1977 law that prohibits U.S. companies or their business partners from bribing, or unduly influencing, foreign officials to advance a business deal. The Trump Organization and its partners in India declined to respond to repeated requests for comment on our findings. 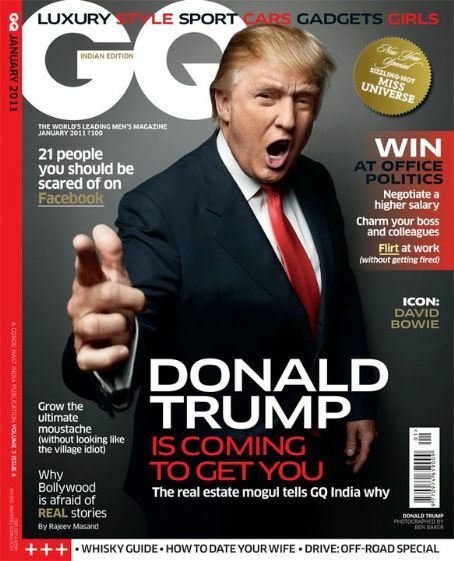 In August 2014, ten months before announcing his presidential run, and three months after Narendra Modi, a far-right Hindu nationalist, became prime minister, Donald Trump and Donald Jr. visited India for the official launch of a luxury tower in Mumbai and to promote a twin tower property in the nearby city of Pune. The Trumps flew in on Donald’s private jet and spent two days at the St. Regis, one of India’s most luxurious hotels, and its tallest. (Trump traveled with his own food and silverware, according to an event planner.) Donald gave more than a dozen interviews to the local media, repeatedly praising Modi for doing a “spectacular job” and improving the country’s image around the world. Lamenting the strict laws governing foreign investment in Indian real estate, he said, “Many countries have no regulation whatsoever ... India is the opposite of that.” Perhaps, he suggested, Modi would change matters. During his presidential campaign, Trump rarely addressed immigrant community gatherings. One of the few exceptions was an October 2016 fund-raiser in Edison, New Jersey, organized by the Republican Hindu Coalition, a conservative lobbying group founded by the Indian-born Chicago electronics billionaire Shalabh Kumar. Longtime Republican Party fund-raisers, Kumar and his family donated more than $1 million to Trump’s presidential run, an expression of support for Trump’s strong anti-Muslim stance and private assurances, given during a July 2016 meeting at the Southampton home of Steven Mnuchin, now secretary of the treasury, that he would be tough on Pakistan. Trump’s views meshed nicely with those held by the nativist, Muslim-baiting Modi, whose closest political ally in the United States also happens to be Kumar. Kumar played a pivotal role in ending Modi’s global political isolation after the mob killing of hundreds of Muslims in 2002 in Gujarat while he was the state’s chief minister. Modi had been widely accused of failing to prevent the massacre. When Kumar organized a U.S. congressional delegation to meet Modi in 2013, it was a turning point in the future prime minister’s efforts to gain international respectability. Real estate in India is a notoriously corrupt industry, regulated by a hulking government bureaucracy that runs on graft. The World Bank Group’s most recent “Doing Business” report ranked India 181st out of 190 countries in terms of the difficulty of obtaining construction permits—an improvement over the previous year, when it ranked 185th. Acquiring the permissions to build even a simple warehouse in Mumbai, according to the report, requires nearly 40 different permits. Real estate corruption is so entrenched in the city that some bureaucrats have even come up with an informal bribery schedule, with rates tagged to each stage of approval, plus premiums for prime locations. Permits in the city center, including Lower Parel, where the Mumbai Trump Tower is being built, went for about $20 per square foot for the most basic permissions, according to a 2014 Times of India investigation. At that rate, bribes to secure permits for the tower, planned for 900,000 square feet, could easily run into the millions of dollars. “This kind of profession, in order to carry out the work, it requires cash payments to politicians. You can’t get away from it,” Pankaj Kapoor, who runs Liases Foras, an independent real estate rating and research agency, told me. By the end of 2017, foreign investors had plowed $25 billion into Indian real estate, about 7 percent of total foreign investment into the country during that period. Indian developers, flush with foreign cash, spun out plans for high-end, luxury apartment complexes, which the country’s burgeoning class of millionaires and billionaires demanded, both as status symbols—and, according to experts on financial crimes and corruption, repositories for large amounts of undeclared wealth. Politicians in India have followed this flow of money, swapping their influence over licenses, permits, and approvals for shares in real estate companies, luxury apartments, and hefty campaign contributions. Campaign disclosure laws are poorly enforced, and elected officials are for the most part not even required to declare their conflicts of interest, making financial ties between real estate and politics difficult to trace. By late 2010, a string of high-profile corruption scandals, which received almost daily coverage in the Indian media, had exposed the depths of the ties between builders and politicians. In 2011, Transparency International’s Corruption Perceptions Index gave India a score of 3.1 out of 10 (zero being the most corrupt), placing the world’s largest democracy alongside Albania, Tonga, and Swaziland. Foreign investment in Indian real estate dropped by a third in one year, with many investors citing graft as a major reason for pulling out. Yet this is precisely when the Trump Organization moved in, announcing its first licensing deal, for a “super-luxury” tower in Mumbai in January 2011. To understand this decision, it helps to remember that Donald Trump built his career in real estate in the 1970s and ’80s in New York City by cultivating, cajoling, threatening, buying up, and manipulating politicians and public officials to obtain tax breaks and public subsidies for his construction projects. He prided himself, according to the late investigative reporter Wayne Barrett, author of a 1992 biography of Trump, on “never having met a public official, banker, lawyer, reporter, or prosecutor he couldn’t seduce.” He contributed generously to political candidates and hired people with close ties to officials with direct influence over his projects. Trump also ensured that he had what Barrett called an “in-house advocate” in practically every city and state agency—and courthouse—that had a say over his projects. We shared our findings with legal experts researching the Trump Organization’s overseas deals, including Jessica Tillipman, who specializes in anti-corruption, compliance, and government procurement law at the George Washington University Law School. “The strongest evidence,” she said, “is that wherever the Trump Organization is doing business, particularly in developing countries with reputations for corruption, they seem to keep either failing to do adequate due diligence or look the other way.” Indeed, recent investigations into Trump-branded projects in Azerbaijan, Georgia, and Panama have shown that the Trumps repeatedly partnered with businesses and real estate brokers with evidence of ties to criminal activity. Most of what can be publicly confirmed about Trump’s deals in India stems from his limited financial disclosures, which include far less detail than a tax return. First released by the Federal Election Commission in July 2015, these disclosures showed that the subsidiaries Trump created to do business in India were all incorporated through a third-party registration agent in Delaware—a state described by the Institute for Economic and Tax Policy as an “onshore tax haven” and a “magnet” for anonymous shell companies. Without these disclosures, required by law when he ran for office, there would be no paper trail linking any of Trump’s companies to ones in India paying him licensing fees. The opacity of Trump’s global business empire is mirrored by the lack of transparency among its licensees in India, all but one of which are unlisted companies, structured as private limited companies or limited liability partnerships with minimal reporting requirements. Each of the partner companies is linked, in turn, to dozens of unlisted subsidiaries, some spread across multiple countries. The Trump Organization’s dealings in India represent one more piece of the murky puzzle of a president with unprecedented conflicts of interest. Trump’s partners are so closely intertwined with the ruling party in India that it is nearly impossible to distinguish between his business activities prior to becoming president and his foreign policy priorities while in the White House. This presents Americans with an unsettling question: When Donald Trump takes a hard line with Pakistan or cultivates India’s nativist prime minister while continuing to profit from real estate deals tied to members of the Indian government, is he acting in the best interests of the United States, or his own? Trump’s first major partner in India was a man named Harresh Mehta, the founder of Rohan Lifescapes, a real estate firm that has reaped massive profits from Mumbai’s slum-redevelopment boom. In Mumbai, an island city in which there is almost no land left on which to build, real estate is among the most expensive in the world. Nearly half the city’s twelve million people live in slums or informal housing settlements. Another 2.5 million hold below-market leases on tenements in crumbling pre-1940 buildings managed by the state. Over the past two decades, privatization has come to dominate municipal housing policy, with the city offering developers the chance to build market-rate housing in return for rehabilitating slums and old housing. In the process, many large slum properties have fallen into the hands of developers with access to foreign capital. “Developing slum land is the only way to build in Mumbai now,” Mehta told the Indian business newspaper Mint in 2008. Mehta was a controversial figure in Mumbai long before he met the Trumps. Among the city’s architects, public officials, and builders—who refer to him as “Harresh bhai” or “Brother Harresh”—he is known for his close connections to the most powerful elected officials in the state, including the influential BJP city chief, a former city council member. A senior state official and an architect with knowledge of operations at housing agencies and planning departments, both of whom spoke on condition of anonymity, said that Mehta’s firms have been known to use bribes and even threats to secure his land deals, particularly in their efforts to meet a crucial legal requirement to gain prior consent from 70 percent of the residents of properties slated for redevelopment. At this point, the Trumps were already in business with Mehta. Their partnership was brokered by a man named Kalpesh Mehta (no relation to Harresh), then a recent graduate of the Wharton School, where Trump, Donald Jr., and Ivanka all received their undergraduate degrees. After a short stint with the Carlyle Group in New York, Kalpesh became a vice president in Lehman’s real estate private equity division in India, coordinating the firm’s large investment into Harresh Mehta’s play in Golibar. Kalpesh’s work on that deal must have impressed Brother Harresh, because he joined a Rohan subsidiary, Rohan Developers Private Limited, as a director in March 2010, and later that year was named a director of at least three other companies owned by Harresh Mehta and his family. In February 2010, before Kalpesh Mehta joined the firm, Rohan had submitted plans to the city to redevelop a dilapidated hospital in an upscale south Mumbai neighborhood into a new 21-story residential tower. In May, two months after Kalpesh was brought on, Rohan submitted new plans for a much larger tower to be built on both the hospital site and a neighboring plot of land on which a rent-controlled building stood. By October of that year, the Trump Organization had registered two companies in Delaware, Trump Marks Mumbai LLC and Trump Marks Mumbai Managing Member Corporation, entities that would soon collect licensing fees for the significantly enlarged redevelopment project. Three months later, as Harresh Mehta’s company was being pilloried in the Indian press for the evictions and alleged fraud in Golibar, Bloomberg reported that Trump was going to “alter Mumbai’s luxury landscape” by partnering with Rohan to build India’s first Trump Tower. The Trump Tower project almost immediately sparked controversy. Rohan’s architects had told the city in May 2010 that the proposed redevelopment would be “entirely for the rehabilitation of the existing tenants only.” Six months later, however, the firm had bought out almost all of the 26 long-term leases in the rent-controlled building on the second plot. The lone holdout was a single family with long ties to the neighborhood. I spoke with Prasad Panvalkar last April, in the cramped back room of his family’s 70-year-old printing-ink business, a few blocks from his former home at the Trump site. Panvalkar, now in his late fifties, told me his wife, Smita, had been born and raised in the building and refused to accept a settlement that would require the family to relocate. When Panvalkar insisted on their legal right to an apartment in the new development, he said a director at the firm refused. Over the next few months, the Panvalkars endured repeated threats from representatives of Rohan, who warned that they had “all kinds of ways” to force the family to leave, Panvalkar told me. There is, today, no Trump Tower on the site of the Panvalkars’ old home. The deal, which Donald Trump was so high on that he described it to GQ as “one of the most luxurious buildings in the world,” fell apart in the spring of 2012. A Wall Street Journal interview with Donald Jr., in September 2013, attributed its demise to changes in the city’s real estate rules, which would have required revisions to the tower that “wouldn’t have fit into the Trump standard.” Yet hundreds of pages of city and state documents, as well as interviews with public officials, lawmakers, and architects familiar with the project, tell a very different story of the tower’s collapse. In Mumbai, city and state officials determine how much a developer can legally construct on any plot of land, using a location-based formula that calculates the permissible square footage as a ratio of the footprint of the plot. A series of exemptions allows bureaucrats and politicians to grant developers much more square footage for certain categories of buildings, including redevelopment schemes for old buildings—like the one that had been Panvalkar’s home. Developers can also purchase a limited amount of additional construction rights, at rates set by the city based on the value of the land. In 2011, according to The Times of India, the realty rate for residential construction in the upscale, seafront Girgaum neighborhood, where the tower was planned, was about $800 per square foot. Developers were also permitted to claim certain building spaces like stairways, elevators, fire escapes, and fire refuge areas—typically small spaces every few floors—as exempt from the square-footage calculations. For high-rise buildings in expensive parts of Mumbai, however, where fees to the city can balloon into millions of dollars, these exemptions were often the subject of manipulation and fraud. Such was the case at the Mumbai Trump Tower. In early 2011, a state lawmaker named Prakash Binsale, from the local Nationalist Congress Party, learned about a luxury building advertising enormous, 4,000- to 5,000-square-foot apartments in the middle of his district. A former urban planner, Binsale was suspicious about the size of the apartments, which seemed out of scale given the location. He pulled the related documents filed with the city and began to investigate. The permissible apartment size for the site was only about 1,500 square feet, but Rohan’s plans claimed much more by designating large areas as fire refuges and fire decks, which he said could later be converted into rooms. “This was a blatant violation of the rules!” Binsale told me. The plot was situated between two major roads wide enough to accommodate large fire-fighting equipment. Binsale found it implausible, then, that the fire refuges served a legitimate safety purpose and was shocked that the plans were approved. He believed he had stumbled upon a fraud designed to allow the builder to construct a far larger building than the regulations permitted. “These clearances simply could not have happened without money,” he said. “I am absolutely certain that bribes were paid.” Binsale calculated how much Mehta and the Trumps may have stood to gain from the plans. It was significant. Based on initial news reports of the prices of the apartments, which ran between $8 and $10 million, he estimated $100 million in additional profits from the illegal approvals alone. I tried to track down the three senior officials who signed off on the plans, in search of an explanation. One of them, the city’s chief fire officer, died of a heart attack in 2011. According to news reports, he was posthumously indicted by the Anti-Corruption Bureau of the Mumbai police on an unrelated 2009 financial irregularities case. The city’s executive engineer had retired and refused to answer any questions. Swadhin Kshatriya, the municipal commissioner, went on to become the chief secretary of the state government, the most powerful bureaucratic post in the state, and is now a state commissioner; he did not respond to requests for comment. In a September 2011 letter to Mumbai’s municipal commissioner, Binsale urged the city to cancel all approvals on the project, alleging “gross violations” of construction regulations. By then, in the wake of a wave of corruption scandals, Maharashtra’s chief minister, akin to the governor of a U.S. state, had resigned, and Mumbai was—for a brief interlude—in a reform phase. The Congress Party, which governed the state at the time, brought in a replacement with a clean reputation, Prithviraj Chavan. Chavan appointed a new municipal commissioner, who tightened the rules around exempted spaces. The state’s Urban Development department investigated the Trump approvals and, in an internal memo written at the end of the year, detailed five “irregularities,” including the approval of the massive fire decks. In January 2012, Harresh Mehta acknowledged to The Times of India that they had gone “beyond what was permitted,” adding that under the new municipal commissioner, the city had become “extremely strict.” Three months later, all approvals on the tower were revoked. The deal was dead. Trump may have been aware of at least some aspects of these corrupt project designs. He boasted in the GQ article that the 65-story building would “only have 45 apartments,” a feature that made it “super-luxury,” adding that he was working closely with the developers on the “magnificent architecture.” It’s hard to believe that he thought the units were going to be a mere 1,500 square feet. On that same trip, a reporter from the Indian news channel NDTV asked Donald Jr., who was in Pune at the time, about delays on the tower. Donald Jr. still seemed to think there was a way to save it. Rohan was “faced with regulatory issues like everyone else, so you know we’re underway, and when that gets worked out we’ll be going forward,” he said, adding that he had a “great partnership with them.” But the Trump Organization’s association with Brother Harresh ended not long afterward. In 2015, Harresh Mehta got fresh approvals from the city for a new project on the same site, less than half the size of the initial Trump Tower plans. Panvalkar is waiting for it to be completed, so he can move back home. If the Trump family learned anything from the collapse of their first high-profile project in India, it seemed to be that they needed to find even more politically connected partners. In fact, the reason Donald Jr. was in Pune in April 2012 was to sign another brand-licensing deal, this one for twin residential Trump Towers, with a luxury real estate firm called Panchshil Realty, run by brothers Atul and Sagar Chordia. The Chordia brothers, who are among the richest people in India, were at the time best known for their long-standing ties to Sharad Pawar, a powerful political figure in the country, a former member of parliament, national cabinet minister, and Maharashtra chief minister. In 2011, debates in the state assembly as well as a series of prominent investigations in the English-language Indian press detailed how Pawar’s influence had proved useful to the Chordias’ real estate business, winning them handsome construction contracts and allowing them to amass several hundred acres of public land at below-market prices. Panchshil Realty did not respond to our requests for comment. Donald Trump’s second attempt at a Trump Tower in Mumbai was announced in September 2013. The 800-foot structure, with 400 “uber-luxe” three- and four-bedroom apartments starting at $1.3 million, was to be located within a development called The Park, a 17.5-acre plot purchased the year before for about $500 million. This time, Trump enlisted a partner with deeper pockets and better political connections than Brother Harresh: Mangal Prabhat Lodha, one of India’s wealthiest men, founder of the Lodha Group, which describes itself as “India’s No.1 real estate developer,” and a five-term state lawmaker with the BJP. Like Trump, Lodha has been unwilling to distance himself fully from his business interests, and, as with Trump, his children are now the public face of his company. Both men have also set up similar business structures. The Lodha Group is a sprawling corporation with dozens of linked subsidiaries. According to a 2015 bond offering from a Lodha subsidiary in Mauritius, the Lodha Group had nearly 80 subsidiaries and associates in India, as well as offshore holdings in Jersey, Mauritius, the Netherlands, and the United Kingdom. India’s Ministry of Corporate Affairs lists dozens more companies connected to the Lodha Group in Mumbai. Several Lodha Group projects are mired in lawsuits and police complaints alleging fraud, illegal construction, illegal sales, and violations of city planning regulations, some of which were publicly acknowledged as potential risks by the company in the bond offering and in a 2009 preliminary prospectus in advance of the firm’s planned initial public offering (yet to take place), which listed dozens of civil and criminal lawsuits against the firm and its directors. The Trump Organization first began exploring a partnership with the Lodha Group sometime in 2012, well after those declarations, according to statements to the press by both Donald Trump and Abhishek Lodha, Mangal’s older son, who is managing director of the Lodha Group. The previous year, the Lodha Group had been the target of a well-publicized income tax raid on several of its properties. The raid was part of an Income Tax Department investigation into multiple Lodha Group companies, which identified nearly $300 million in undeclared funds. In October 2013, a year before Donald Trump flew to India for the project’s launch at the St. Regis, an internal government memo written by a senior income tax official was obtained by local lawmakers, who held a press conference. The memo recommended the prosecution of Lodha’s directors, calling it “quite obvious” that “various entities of this group have been concealing income.” It also questioned whether the firm, which had received more than $600 million from foreign private equity funds, might be laundering money through offshore tax havens, including Mauritius. The Lodha Group paid an undisclosed fine to settle the tax bill, but some officials in the Income Tax Department have continued to pursue the case. Last year, a spokeswoman for the Lodha Group told The Washington Post that the case was “old” and unrelated to Trump. By 2016, sources told us, over a dozen Lodha Group companies were implicated in investigations involving five national agencies—the Enforcement Directorate, the Securities and Exchange Board of India (SEBI, the equivalent of the U.S. Securities and Exchange Commission); the Directorate General of Central Excise Intelligence (DGCEI, the equivalent of the IRS’s criminal investigations unit); the Reserve Bank of India; and the Income Tax Department—on allegations of money laundering, tax fraud, and violations of foreign exchange regulations. A source at SEBI who had investigated money-laundering allegations related to India’s stock market in 2014 told us it had found evidence suggesting that various Lodha Group companies were “among the beneficiaries in the round-tripping of funds.” Round-tripping is a common form of money laundering in India, where undeclared money—sometimes from potentially illicit sources—is routed over-seas to escape the attention of tax authorities and then returned to the country through legitimate investment channels. Because SEBI only regulates public companies, however, it couldn’t pursue a case against the privately held Lodha Group, the source told us. Since 2016, according to two sources at the agency, the Enforcement Directorate, at SEBI’s request, has also been investigating whether alleged financial irregularities at a subsidiary of Lodha Developers, the firm’s real estate wing, violated India’s laws against fraud and money laundering. The subsidiary, Cowtown Land Development Private Limited, allegedly loaned out nearly 250 times its declared capital and profits to other companies in the Lodha Group. The Indian Express reported that the company caught the regulators’ attention after four investors complained that Cowtown had canceled sales on a project two months after they had bought apartments there, and refused to return their money. The Lodha Group did not respond to our repeated requests for an interview nor to our questions about any of these investigations. But in March 2016, a company spokesperson told The Indian Express that it had no knowledge of SEBI’s investigation at the time. We obtained a copy of an internal memo describing a joint 2016 investigation by the Income Tax Department and DGCEI into another company, Hi Build Constructions and Precast Pvt Ltd, which had both received and paid out “large sums” of money from and to five Lodha Group companies in 2014 and 2015. Despite starting with roughly $1,500 in capital, in just two years the company had an “unbelievable” liability of nearly $400 million. These “glaring facts,” the memo concluded, suggested that Hi Build was a Lodha Group shell company “engaged in paper transactions only, i.e., receipt and issuance of invoices without actual receipt and rendering of services”—a textbook indication of money laundering. Two of the companies that allegedly funneled large amounts of money into the shell were Lodha Developers Pvt Ltd and Jawala Real Estate Pvt Ltd, Trump’s licensing partners on the Mumbai Trump Tower. 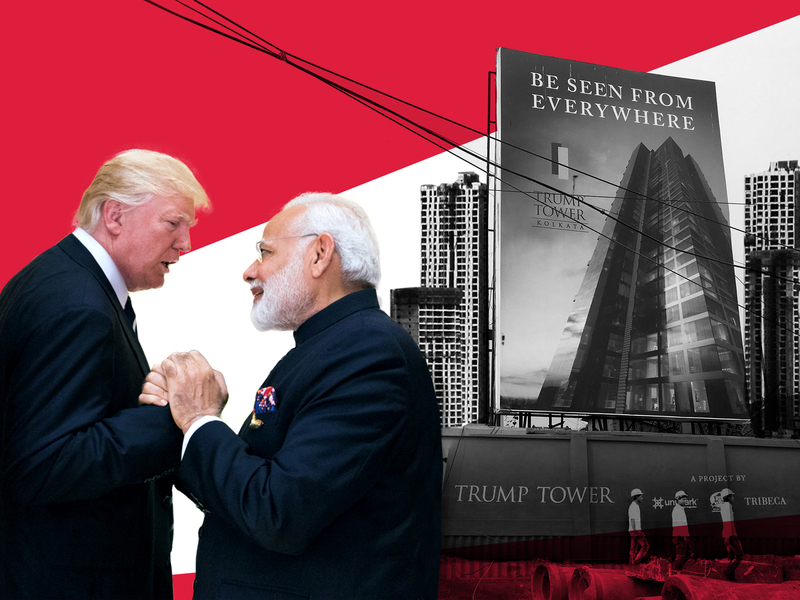 In May 2016, not long after Trump became the presumptive Republican presidential nominee, billboards cropped up across Mumbai proclaiming TRUMP IS BACK and advertising opportunities to buy apartments in the Lodha Group’s Trump Tower. In a statement to Mumbai’s Mid-Day newspaper, a Lodha spokesperson denied that the timing had anything to do with Trump’s recent electoral success, claiming that more than 50 percent of the apartments had been sold during the launch in 2014 and that the rest would soon be available. I visited the sales office shortly after Trump’s inauguration. Prospective buyers sipped iced cappuccinos and perused the bombastic promotional materials, in which Trump describes the gold-hued tower as the “jewel in the Trump crown.” Each apartment in the Trump Tower Mumbai, when completed, promises access to private jet service, dedicated servants’ quarters with a separate staff entrance and elevator, and seven levels of security checks for workers. The building was, at the time, a 43-story shell of concrete and iron, barely discernible against the city’s dizzying cluster of cranes, scaffolding, and high-rises. The sales office inside, however, was flanked by an unmistakable black granite facade, emblazoned in gold with TRUMP TOWER MUMBAI: THE ULTIMATE INDULGENCE. Last summer, just before Modi’s visit to the White House, the Lodha Group announced it was planning another push to sell apartments in the Mumbai Trump Tower, which it claimed was already 60 percent sold. By then, all the high-level investigations into the Lodha Group had stalled. Sources at three of the participating agencies told us in March 2017 that they were under “extreme” political pressure during the probes, given Lodha’s role in the ruling party—he was named to the National Executive committee of the BJP in March 2015—and Modi’s slow but decisive stacking of investigative agencies with loyalists. But the timing also coincides with the inauguration of Donald Trump, Lodha’s business partner and the prime minister’s political ally, a remarkable confederation between a sitting U.S. president and a foreign elected official. In February 2018, senior officials at the Enforcement Directorate and Income Tax Department confirmed that the investigations into money-laundering allegations at their agencies had been closed. The Enforcement Directorate said it “did not find anything suspicious,” and senior officials at DGCEI, now called the Directorate General of Goods and Services Tax Intelligence, claimed to have no knowledge of the internal memo we obtained. An Indian government spokesperson declined to respond to our questions about the allegations of political influence over the investigative agencies. In July 2012, just months after Donald Jr.’s failed attempt to salvage the first Trump Tower deal, Kalpesh Mehta established a company called Tribeca Creators LLP and was hired as a consultant to source and procure new projects for the Trump Organization. Within a year, he had resigned from all of Harresh Mehta’s companies and was calling his company the Trump Organization’s “exclusive India representative.” In 2014 and 2015, Kalpesh Mehta concluded three brand-licensing deals for Trump Tower projects: two in Gurgaon, a sprawling suburb of New Delhi; and one in Kolkata, which was formally launched in October 2017, nearly a year after Trump was elected president. Since then, the web site for one of Mehta’s firms, Tribeca Developers (he runs a number of similarly named companies: Tribeca Creators, Tribeca Devmgmt, Tribeca Dwellers and Builders), has been updated to indicate that his role as a consultant for the Trumps has significantly expanded: Tribeca is now involved in “every aspect of the development—from construction and design to sales and marketing—to ensure its conceptualization and execution is up to par with the high global standards of Trump.” Donald Jr. is now prominently featured and listed as an advisory board member. In a recent television interview, he said “Kalpesh has become truly a friend and not just a business partner.” The web site does not mention Kalpesh Mehta’s involvement in the first, failed Mumbai project. For this project, Kalpesh Mehta teamed up with a local development company with a Trumpian name: M3M, or “Magnificence in the Trinity of Men, Materials & Money.” Even in Gurgaon, a town built on frenzied and often illegal land purchases by politically connected developers, M3M has a poor reputation. The firm was founded by Basant and Roop Bansal, two brothers who grew up in a nearby village and started off as small-time land aggregators, known for buying cheap land from farmers and selling parcels at steep markups to larger and better-known developers. According to news reports, they were investigated for tax evasion twice, in 2008 and in 2011, when investigators—tipped off by a lavish $20 million wedding party Basant Bansal held for his daughter on a Turkish island—obtained evidence that the Bansals were hiding roughly $70 million of undeclared money. None of this seems to have deterred Mehta or the Trumps from pursuing a partnership with them. These connections also came in handy when it was time to get permissions for the Trump Towers project, with help from the daughter of the American president. According to a state planning official familiar with approvals on the project, final permissions were expedited after a high-level visit to the country by Ivanka Trump, who had been invited personally by Modi to head the U.S. delegation to a “Global Entrepreneurship Summit” in the southern city of Hyderabad, in late November 2017. Shortly after her visit, clearances for the Gurgaon Trump Towers went through in “no time,” based on directives from BJP party leaders in New Delhi, the planning official said. When I visited the construction site in January, on the eastern edge of Gurgaon, an M3M sales associate pointed to a small, bare patch of land, surrounded by several other high-rises, a golf course, and a parking lot, as the spot where the Trump Towers would eventually be built. The Gurgaon towers are part of a larger project called Golf Estate, still under construction by M3M. No one from M3M would answer any of my questions about the project; I was directed instead to a sales office a few miles away, housed at the five-star Gurgaon Oberoi hotel and marked by the signature gold TRUMP sign. The saleswoman there told me that M3M was only responsible for acquiring the land and the permissions on the project: The construction, design, and sales would all be handled by Tribeca Developers—Kalpesh Mehta’s firm. Trump did not report any royalties from this Gurgaon project in his ethics filings, nor did he list any licensees for the project. But Tribeca’s web site for Trump Towers Delhi NCR carries a disclaimer listing a company named Olive Realcon Pvt Ltd as the owner and developer of the property, using the Trump name under license. Olive Realcon is an M3M subsidiary, and in January 2015, Kalpesh Mehta acquired a 10 percent stake in the company and was named a director through a shareholding agreement, an analysis of the company’s corporate filings revealed. Mehta resigned from the firm in October 2017, but two other employees from Tribeca Developers remain directors at Olive Realcon. Kalpesh Mehta seems to be in charge in Kolkata, too. The tower site there is off a busy highway in the southeastern part of the city. When I visited in January, a single floor had been built. I met with two of the developers and the architect on the project, each of whom said they were not authorized to speak about any aspect of the deal. They did say they hoped that associating with the Trump name would raise their profile and directed me to Mehta for more information. Months before the project launch, the Kolkata licensing deal had already brought Trump up to $1 million in royalties, according to his 2017 disclosures. The filings name five different licensees for the deal, including a publicly traded company called RDB Realty and Infrastructure Limited, part of the RDB Group, and one of the group’s subsidiaries. I spoke to Vinod Dugar from the RDB Group in January. He told me that the licensing fees for partners on these kinds of projects typically run to 8 to 15 percent of the total cost, which, based on press estimates, would amount to millions more in royalties for Trump. In 2011, RDB was barred by SEBI from participating in the stock market for four years on charges of insider trading, and last December, in a separate case, SEBI fined Dugar for insider trading, according to news reports. A day after Donald Jr. visited Kolkata in February, where he met with buyers, business executives, and real estate developers over cocktails at the JW Marriott hotel, Income Tax officials conducted a “search operation” in the offices of the RDB group over concerns of alleged “financial irregularities,” again according to news reports. Neither Dugar nor anyone else at the RDB Group responded to questions about SEBI’s charges or the Income Tax operation. Another one of the five licensees: none other than Kalpesh Mehta’s Tribeca Creators. Even in the complex ecosystem of Trump deals, this arrangement stands out. Companies owned by Kalpesh Mehta are now paying money to the Trump Organization as a business partner and receiving money from it in their role as consultants and dealmakers. Again, Kalpesh Mehta did not respond to our repeated requests for comment, and when asked by a CNBC affiliate about the licensing fees, Donald Jr. demurred: “We don’t discuss these things,” he said. The Trump Organization has one more active project in India, yet another deal brokered by Kalpesh Mehta—a Trump-branded office tower, also in Gurgaon, with a real estate private equity fund called India Real Estate Opportunity or IREO. The firm was founded in the early 2000s by two men who, like Kalpesh, had graduated from the Wharton School. They quickly entered the Gurgaon market and acquired large tracts of land. Announced in April 2016, during the heat of the Republican primaries, the Trump deal was for a luxury office tower with more than 600,000 square feet of leasable space in a private development called IREO City. IREO, like most of Trump’s other partners in India, is also tied to the BJP, in this case through a personal connection: The fund’s managing director, Lalit Goyal, is the brother-in-law of an influential BJP politician in New Delhi, Sudhanshu Mittal. It was widely reported that IREO was investigated by the Income Tax Department and the Enforcement Directorate in 2010 on allegations that it had skirted foreign investment laws to buy farmland and had engaged in round-tripping related to an influx of more than $1.5 billion from companies registered in Mauritius and Cyprus. In October 2010, tax investigators also looked into Mittal’s accounts, on allegations that the senior BJP politician had routed undeclared money into IREO, his brother-in-law’s company. Both Mittal and Goyal denied any business links with each other at the time, and in November of that year, an IREO spokesperson denied the charges against the company and told reporters that the foreign investment had come from major financial institutions, passed through IREO subsidiaries in Mauritius and Cyprus. IREO, like the Trump Organization and the Lodha Group, has dozens of subsidiaries and holding companies across multiple locations, making it difficult to trace money flows and property purchases. It also appears to be in trouble with some of its largest international investors. Two prominent hedge funds, based in New York and London, sued the fund in a Mauritius court in 2016 for having “failed as good stewards of the investors’ capital,” according to a recent report in Barron’s. In an April 2017 letter to investors, the hedge fund managers reportedly said that ten years after investing $1.6 billion in IREO, they had only received $250 million, while IREO took in $300 million in management fees. By mid-2017, the Enforcement Directorate’s inquiry into IREO—as with its probe of the Lodha Group—had apparently stalled. An investigator working on the IREO probe told The Washington Post in June 2017 that he expects the investigation will now “go slow” because of the subjects’ ties to the president of the United States. As of this writing, the Gurgaon Trump office tower still only exists on paper. When I visited in early 2018, all that was visible was a sales office and a few goats grazing on a large, grassy expanse of land. IREO did not respond to repeated inquiries about when the project would launch, and its sales staff said they had no details. That hasn’t stopped the money from flowing to the Trump family. Between July 2015 and June 2017, IREO Private Limited paid Trump royalties of up to $2 million, via a Trump Organization entity called DT Tower Gurgaon LLC, incorporated in Delaware in March 2015, just a few months before Trump announced his bid for the presidency. It’s an odd time to be launching so many new projects in India, during what many real estate experts are calling the country’s worst-ever slump for housing sales. “What we’re going through now in the real estate sector is the equivalent of 2007–2008 in the United States,” real estate analyst Pankaj Kapoor told me. He also showed me the numbers: Every city where the Trump Organization has projects has more than two years of unsold inventory; the capital region, which includes Gurgaon, tops the list with five years of unsold units. There is an unmistakable glut in the luxury market, and since 2014, Kapoor said, prices in the sector have been stagnant and sales sluggish. But Trump and his partners are telling the press they are bucking this nationwide trend, selling preconstruction units at lightning speed. A few days before Ivanka’s visit for the entrepreneurship summit, Indian newspapers announced that the Trump Tower Kolkata had received an “overwhelming response,” selling more than 50 percent of the proposed 140 units, which start at roughly $600,000 for a 2,500-square-foot apartment, in one month. “We knew we were onto something when soon after the project announcement, our sales gallery was over-booked for the first two weeks, and we received over ten checks in the first few hours,” Kalpesh Mehta told reporters. “Trump is a successful name in real estate that no one questions, even today,” he told The Times of India. In February, during his visit to India, Donald Jr. told Business Today that the Kolkata project was 70 percent sold. In Gurgaon, he said, sales had topped $100 million in six weeks. There are two possible explanations for these claims. One is that the numbers are simply overstated. We tried to fact-check the figures about Trump Tower apartment sales in India. Every prospective sale in which a buyer has put down more than 10 percent of the apartment cost is supposed to be recorded with the country’s new Real Estate Regulatory Authority (RERA). An analysis of RERA data in late January showed that fewer than 40 percent of the apartments in the Mumbai Trump Tower had been sold, not 60 percent as Kalpesh Mehta and Abhishek Lodha have both claimed. Registration data for the other projects in the country are still not available as of this writing. Agency records for the Mumbai Trump Tower show only 36 mortgages and sales registered since 2014, eight to Mangal Prabhat Lodha himself, and another nine to current and former Lodha Group directors and officials. Of the 23 apartments in the first Pune tower, which was completed and ready for occupancy in 2015, only 16 sales have been registered; in the second tower, launched by Donald Jr. in February, only one has been registered. Before becoming president, Donald Trump called the Foreign Corrupt Practices Act a “horrible” law that puts American companies at a “huge disadvantage.” Whether the FCPA covers franchise or licensing deals of the sort operated by the Trump Organization in corrupt environments from Azerbaijan to Panama remains a fairly untested theory, and experts say it would depend heavily on how much knowledge and control the Trump Organization has over the building and approvals process run by its partners on the ground. “Although [the Trump Organization] says they are just a licensor and the money’s going the other way, they may have a significant amount of control over what happens and what vendors are used, because any time they put their name on it, they want it to look a certain way,” Tillipman, the George Washington law professor, said. Reshmi Khurana, a South Asia expert for global risk assessment firm Kroll, assists international companies trying to avoid violations of anti-corruption laws. She detailed for me what professional corporate due diligence would typically entail for projects the size of the Trumps’ deals in India. She said that hiring an independent firm to interview people in the field about a potential partner’s reputation, along with scanning news reports, would serve as the bare minimum. Standard research would also involve a search for red flags associated with potential partners, including whether they have powerful political connections or financial ties to elected officials, or have been the subject of probes for tax evasion or money laundering. Nearly every one of the Trump Organization’s business partners in India displayed such warning signs to an astonishing degree. Either the Trumps’ research consultants failed somehow to note that their potential partners had widely known political entanglements, had reputations for corruption, and were the subject of active investigations into tax evasion or money laundering—or the Trumps simply chose to look the other way. Bhakta, the former Trump Organization consultant, provided a window into the Trump Organization’s approach to due diligence. He said that the Trumps do employ legal advisers in India to help with diligence related to permits and licenses, but that a substantial part of the responsibility for choosing partners falls to the dealmakers on the ground, people like him, and now Kalpesh Mehta. “I know every developer in every market and their financiers and their capital, so I can get diligence sorted fairly quickly,” he told me. “It’s my word and my diligence that they have surrounding their projects and their capital and their buyers.” The draft agreement with the Trumps to hire Mehta as a consultant, which we obtained, appeared to confirm this, as it includes responsibilities to conduct diligence investigations into the principals of all potential projects and to monitor legal, tax, and regulatory issues. When I pressed Bhakta on what counted as diligence, he told me the Trump Organization has a “standard checklist,” that included capital provisions, quality, and track records on payments and delivery. Another explanation for the bloated sales figures in the Trump buildings in India is that people flock to them hoping to buy something more than a place to live. There are two unusual aspects to this arrangement, according to experts on foreign corruption. First, that the focus of the Trump Organization’s due diligence appears to be assessing partners’ liquidity and ability to pay, and not screening for the risk of corruption. Second, that the diligence work was trusted to fixers like Bhakta and Mehta, men who have what Tillipman calls “a clear conflict of interest.” Mehta, according to the draft agreement, would make up to 12 percent for bringing in a Trump Tower licensing deal. Moreover, since 2015, he has also been a direct business partner on at least two of the deals that he brokered. Leaving diligence to people highly motivated to close a deal would barely seem to qualify as diligence at all. More than a year into the Trump presidency, four of the Trump Organization’s five projects in India are still being built or have yet to break ground. As each one reaches new construction benchmarks, additional permits and clearances will be required from government agencies. Given the business environment in India, and the track record of Trump’s partners, the path through these bureaucratic obstacles could easily involve the payment of bribes. Units will continue to be sold, and the American public will continue to have no access to the identities of the buyers. Trump has not made the terms of his licensing deals there public. But if the patterns on past deals hold, with each construction benchmark reached, and as each apartment is sold, the developers will direct a portion of the profits, with little transparency about the identities of the buyers or the source of their money, to the Donald J. Trump Revocable Trust—run by Donald Jr. and Eric Trump, and from which the president can draw money at any time, without disclosure. Trump’s conflicts of interest in India remain an unfinished story. These ethical quandaries will persist, in real time, throughout the course of his presidency. Anjali Kamat is an investigative journalist and Belle Zeller visiting professor at Brooklyn College.